Fly Parasites are nature’s original method of fly control. Fly Parasites – Keep Your Livestock and Crops Free from Pesky Flies and Insects with Nature’s Own Amazing Fly Control! Fly Parasites are nature’s original method of fly control. These tiny beneficial insects kill the larva before it can develop into a fly. 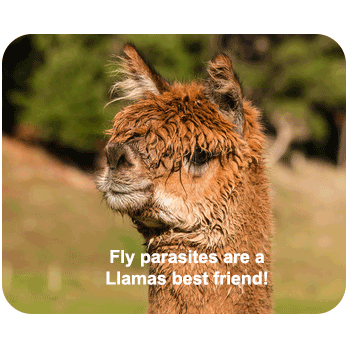 Fly Parasites have been proven highly effective in a wide range of applications such as dairies, horse stables, poultry farms, feed lots, and waste water treatment facilities, anywhere flies breed and cause irritation to animals and humans. Fly Parasites are part of the perfect fly control system! Fly Parasites are gnat size, nocturnal, and do not sting or bite. They spend their entire life cycle on or near manure or decomposing organic material and will not migrate into patios, kitchens or houses. Fly Parasites are just about unnoticeable. Flies are not particular about where they live or get their food, but the female fly is careful about where they lay their eggs. Flies look for fresh manure, garbage, or decomposing organic wastes. About 130 eggs are laid in one batch and females may lay up to 21 batches during her short, 30 day lifetime. 2 days or so after the eggs are laid the tiny, white maggots, called Larva, hatch then after 1 or 2 weeks the Larva will twice shed its skin. The new skin hardens into a brown cocoon, called the Pupa. When the weather is warm this stage lasts 3 to 6 days. Inside the larva is changing into the winged fly. 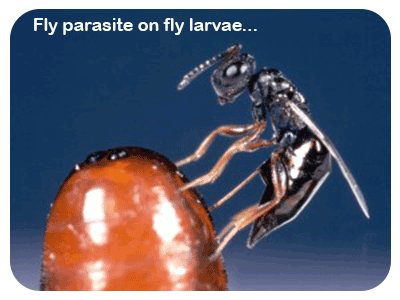 Fly Parasites are also very careful about their eggs. The female Parasite seeks out the immature fly at the pupa stage, bores thru the cocoon and lays up to 7 eggs of her own that feed off the larva until they hatch 2 to 3 weeks later. Within a few days the Fly Parasites will mate and start the cycle of searching out and destroying another generation of flies! When trying to control ﬂies it is easier and less expensive to stop the problem before the problem starts. For best results start using Fly Parasites early in the spring when the weather starts warming up, upper 60’s or warmer, and then every few weeks throughout the summer ﬂy season until the weather begins to cool off in the fall. Flies reproduce 9 times greater than Fly Parasites – to control ﬂies repetition is the key. 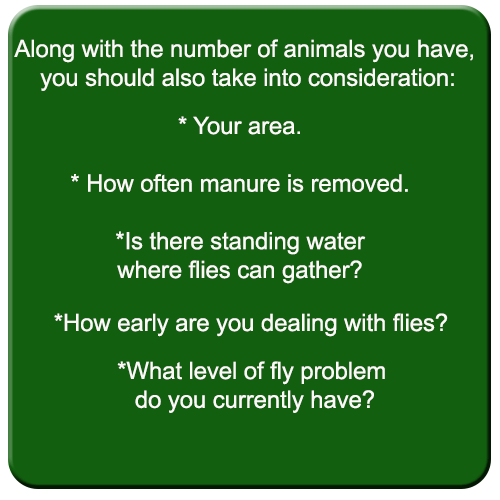 Our easy to use recommended usage chart will help you determine how many Fly Parasites you will need. This is not an exact science.